Rats are the stuff of nightmares to many people. 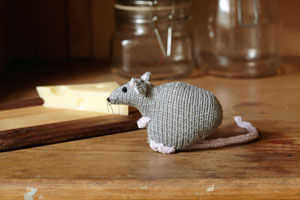 Ours is a cuddly knitted farm rat and therefore not at all scary – more Beatrix Potter’s Samuel Whiskers than George Orwell’s 1984. Rats have a bad reputation and some fairly disgusting habits, but we kept rats for several years – Max, Mica, Micky, Audrey and Lulu – and they were delightful, particularly Audrey, who was very clever and affectionate and would chirp lovingly in your ear.